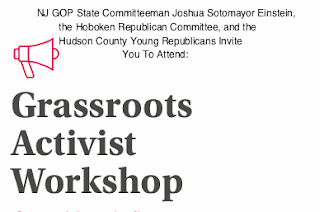 Hudson County – The Hoboken Municipal Republican Committee and the Hudson County Young Republicans invite conservatives, libertarians, small-government activists, and Republicans of all types to join them at New Jersey’s premier Grassroots Activist Workshop. This workshop will teach attendees about the fundamentals of grassroots activism including best practices for building coalitions, managing organizational frameworks, and holding elected officials accountable. On Sunday, Mach 31, from 11am–5pm, at the beautiful Barsky Gallery (49 Harrison St, Hoboken), civic-minded citizens will learn how to get involved and make a difference in local elections and government. 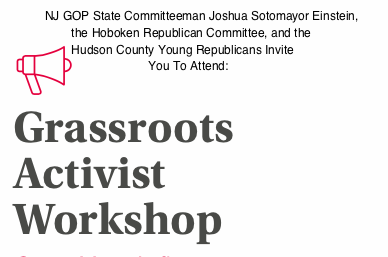 The training will bring together people from across Hudson County and New Jersey, united in their desire to build better communication, messaging, advocacy, and leadership skills. Parking is available free of charge and lunch will be provided.